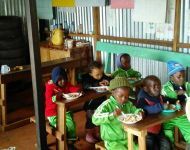 The Feeding Programme provides the children with a hot, nourishing meal at lunchtime. These meals are often the only hot meal that the children receive during the week. 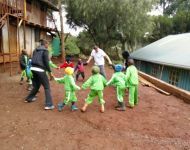 The Compassionate Programme is held over one week during school holidays to provide additional tution and team games to the Children. 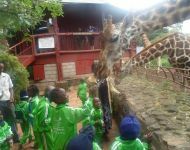 Sponsorship Programme for children who would otherwise not be able to afford primary education.These children often come from families that are struggling to feed and clothe them never mind sending them to school (there are very few free education opportunities in Kenya). 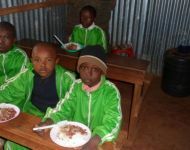 Feeding Programme providing hot nourishing meals for children attending primary school. Reading Programme: we are working in partnership with the Teach A Friend to Read charity to deliver one-to-one coaching programmes throughout Kenya, empowering people of all ages and background with the ability to read. 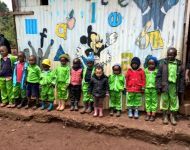 Primary School - we are currently fundraising to build primary school, which will also deliver our reading programme to local residents in the Kangawa Zone of Ngong Town. If you are interested in finding out more about any of our projects, please click on the links or contact us here. The Bouncing Ball Trust is a low-cost charity being run by our Trustees. This enables us to use your money on our projects, which benefits the children and communities who really need it.